The 118 islands and atolls of French Polynesia are scattered across 2,000 square kilometres of the South Pacific like sparkling jewels on a blanket of deepest blue. Divided into five separate island groups, each distinctly different from the next and offering a unique holiday experience – from the dramatic, volcanic peaks of the Society Islands to the remote Marquesas – together they comprise one of those rare destinations for which the photos simply don’t do justice. Here’s a selection of some of our favourite islands of Tahiti. The administrative, economic, cultural and political centre of French Polynesia, Tahiti is the largest of the Society Islands and its capital city, Papeete, serves as the international gateway to the rest of the country. Experience its vibrant blend of French and Polynesian cultures, visit the city’s pearl museum, explore the island’s interior on a 4WD safari, marvel at the daring of world-class surfers at Teahupoʻo, and finish your day with an al fresco, waterfront dinner at the famous roulottes (food trucks) at Vaiete Square. Just a 45-minute ferry from downtown Papeete, Moorea measures ten kilometres across, so it’s easy to hire a car or motorbike and explore this stunning island via the encircling coastal road. It’s a wonderful destination for the entire family, offering fun activities in, on and under the water – teach the kids to snorkel, stroke the velvety wings of docile rays, feed reef sharks and even have your breakfast delivered by outrigger canoe. No list of Tahitian islands is complete without this gem – the ancient remnant of an extinct volcano which rises out of a turquoise, motu-fringed lagoon. Bora Bora’s craggy peaks look down on you from wherever you are, creating a dramatic backdrop to the one of the most romantic locations on Earth. This is a destination that lends itself perfectly to long, lazy days spent enjoying the sunshine, tranquillity and each other’s company, whether it’s lazing on the deck of your overwater bungalow, exploring the many white sand beaches by paddle board or observing the marine residents from a glass-bottomed boat. For a truly unforgettable perspective, treat yourself to a spectacular helicopter flight over the island and lagoon. The Tuamotu group is a collection of 77 atolls, where coconut palms sway on sand-fringed motu, and the pristine waters of the lagoons are filled with an abundance of coral and other colourful marine life. Rangiroa is the largest of these – the world’s second largest atoll, it’s made up of 240 tiny islets that encircle a deep blue lagoon, while outside the lagoon, whales, manta rays and sharks put on a show. Take a boat trip to a deserted motu for a private picnic, visit its famed pink-sand beach, watch the dolphins play at sunset and sample the wines produced at one of the world’s most unique vineyards. Located more than 1,300 kilometres from Tahiti, the Marquesas Islands are among the most remote islands on the planet. The group’s largest island, Nuku Hiva, is French Polynesia’s second-largest after Tahiti, and offers a dramatic landscape of towering peaks, secluded valleys, deep bays and tumbling waterfalls, along with giant stone tiki statues and roaming herds of wild horses. Robert Louis Stevenson and Paul Gauguin both produced great works during their time in Nuku Hiva, but the Marquesan people are celebrated artists in their own right – their intricately-carved wood and stone bowls, plates and statues are much-admired and serve as a fitting memento of time spent in this distant but beautiful part of the world. The islands of French Polynesia are among the most diverse in the world – some richly-cloaked in lush vegetation, others concealing their diversity within vast lagoons, and all with a proud and vibrant culture and history. 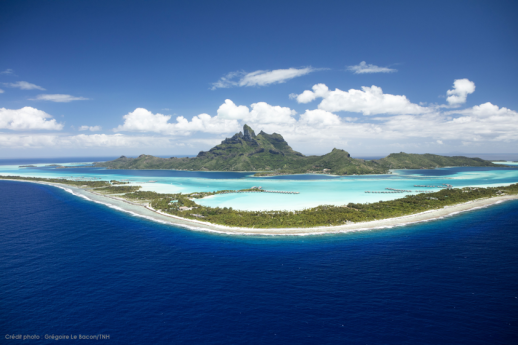 If you’d like to embark on your own South Sea odyssey among the dazzling islands of French Polynesia, ask your personal travel manager for recommendations.